Annie Downs is an author and speaker based in Nashville, Tennessee. Flawed but funny, she uses her writing to highlight the everyday goodness of a real and present God. By weaving together personal stories, humor, and Scripture, she invites the young women reading to experience fulfilled lives with a God who made them on purpose and loves them deeply. When she s not writing books or traveling for speaking events, Annie spends her days writing all over the internet blogging at AnnieBlogs.com and in courage.me, sharing truths about her life in Nashville as a single Christian woman and the stories that are woven into each day. Annie is a huge fan of singer/songwriters, burritos, the Internet, her community of friends, and sports of all kinds. Looking for Lovely by Annie F. Downs is an amazing book! Life isn't easy but learning to spot the lovely in times of hardship helps us to remember all that God has promised. Spotting the lovely helps us to stay positive when the world is negative and wants to steal our joy. I love that there's 7 sessions in this Bible study that teaches us to look for lovely in our day to day lives. Through Looking for Lovely by Annie F. Downs you will learn that He makes everything beautiful in His time. I truly love reading this in the morning when all is quiet in the house to let it soak in. Looking for Lovely by Annie F. Downs has truly changed my whole outlook on life and is helping me to be a more positive person. 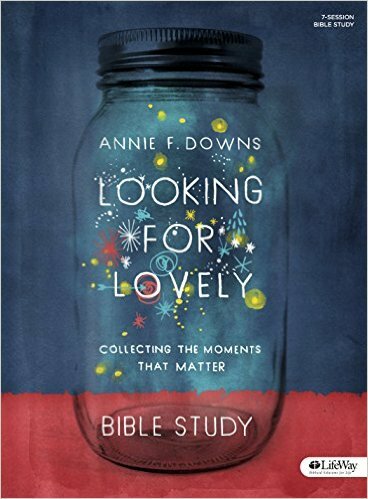 Looking for Lovely is a wonderful Bible study and I highly recommend it! You can find Looking for Lovely by Annie F. Downs on Amazon, Barnes and Noble and other bookstores.